Based on Qu Bo's 1957 novel Tracks in the Snowy Forest, this film presents a band of soldiers struggling to survive in the winter of 1946 as they defend helpless towns from the endless onslaught of raiding bandits. In the wake of the Japanese surrender toward the end of WW2, northeast China was up for grabs, and in the midst of a civil war. The power struggle is between China's People's Liberation Army and several factions worth of bandits vying for control of the area. The most powerful of the bandits is Lord Hawk (Tony Leung Ka Fai), a warlord who appropriately keeps a pet hawk with which he uses to peck out the eyes of anyone foolish enough to fail him. He and his horde of bandits have setup shop in Tiger Mountain which happens to house a sizable ammunition cache. He sends his men out on raiding missions to terrorize citizens of surrounding towns, taking what little food and valuables they have left. The leader of the People's Liberation Army (or PLA for short) in the area is a man referred to as Captain 203 (Kenny Lin). He does his best to keep his unit (unit 203) fed despite the rough conditions. But when a train shows up with a couple of suspicious new recruits and a bundle of food, he can hardly say no despite a feeling of reservation about them. Neither of the new recruits seem like soldiers, yet he can't afford to refuse the help. The first is Yang (Hanyu Zhang), based on a real life soldier of the PLA, who looks more like a bandit than a soldier. The second is nurse Bai (Liya Tong), who immediately puts Captain 203 at ease by tending to the wounded. We're told of three maps each leading to valuable resources from platoons of soldiers, to ammunition, to gold. Hawk holds the ammunition, but he seeks the gold treasure map. We're also told that whoever holds all three maps would be king of the area, but sadly shortly after the idea of these maps are brought up they're forgotten about. Instead the PLA hatches a scheme to send Yang, a trained spy, into enemy territory with one of the recovered maps as a gift ensuring his safe assimilation into their horde, where he can help take them down from the inside out. Inevitably where Westerner's will have a hard time with this film is in keeping its large ensemble cast straight. To its credit there is an attempt (albeit a slightly over the top attempt) made to distinguish characters with unique appearances, particularly Lord Hawk and his henchmen. They appear to have been modeled after comic book or anime characters, but it does allow us to differentiate them. However, most of these henchmen's unique looks and skills are never allowed to matter. Few of them are allowed to do anything with those skills. It's a disappointing oversight as it could have provided more diversity to the action sequences. That diversity of appearance and characteristics, however, does not extend to the PLA army, who are portrayed as seriously as possible. Few of them display distinguishing characteristics, and Captain 203 might as well be generic soldier 203 before being relegated to the background in favor of other characters and situations. Yet the few PLA soldiers we do come to care for are fairly recognizable, one of whom wears a set of circular spectacles and of course nurse Bai is recognizable if only for being the only woman present on the PLA side of things. I should also mention that this film, curiously enough, begins and ends in New York in modern times, with a Chinese-American by the name of Jimmy (Geng Han). He's just gotten a job out in Silicon Valley and spends his last evening in New York hanging out with friends. During this time an old video of a Peking Opera from his hometown jogs his memory of his grandfather who grew up during the aforementioned conflict. As evidence of the story being passed down through generations, several characters are shown documenting the war effort in journals. Yet this subplot to the story feels like an inconsequential one that exits only to extend an already lengthy runtime. While this child (who would grow up to be Jimmy's grandfather) makes for a sympathetic figure, he ultimately lifts out of the story with no effect on the plot or primary characters. At its worst it's uneven, suffering from some pacing issues. Many of its action sequences rely on some very lackluster CGI for 2014-15. These stylized action sequences are, however, mostly well executed and inventive (although it's clear it was meant to be viewed in 3D theaters because of the amount of times objects come flying toward the camera). The best action sequence involves the outnumbered good guys defending the small village of Leather Creek against Lord Hawk's detachment of raiders. While most of these action sequences are solid popcorn action fare complete with slow motion "bullet time" and spurts of blood, a few of them devolve into over-the-top, barely believable scenes that would be far fetched even in a cartoon world. The most egregious of which is a nonsensical post credit scene that seems more like a confusing dream sequence than a natural part of the film. It's sure to leave more than a few viewers scratching their heads. 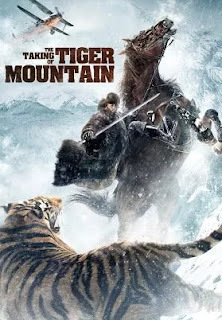 However, the film is at it's best when following Yang in the midst of Lord Hawk's bandits, where questions of loyalty and tests of character keep the tension high. In many ways, these scenes resemble moments in "The Departed" where we follow a spy in a wolves den. They allow for some twists and turns as Yang plots to detonate a wall allowing his fellow soldiers to raid Hawk's stronghold, all while being under tight surveillance. Any misstep could be disastrous. It leads to one of the other standout action sequences. Despite its flaws, it remains an entertaining, energetic, popcorn flick, whose action sequences rival those found in Hollywood's top summer blockbusters. And as China's 10th highest grossing blockbuster of all time, it's one worth seeking out.